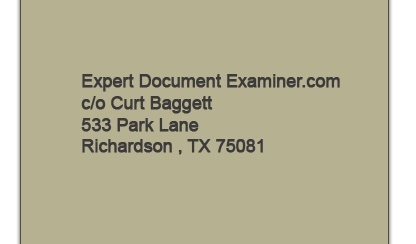 Expert about your forgery case. The Initial Consultation is totally free. We have established easy to order "flat-rate" services to simplify the process of getting a fast expert opinion on your documents, and keep your expenses predictable. If you have more than one questioned document (more than 2 documents with more than 1 signature in question) please call us to provide a customized quote for our services. We do our best to keep your cost down and within budget. In most cases, the extent of the entire case and the cost can only be accurately ascertained after hearing about your situation and looking at the documents in question. We encourage everyone that is unsure how the process works, to click the "verbal opinion" and let us speak with you about your case after we have looked at the documents in question. If for some reason your not ready to spend the $400 for an examination of your one questioned document and initial verbal opinion about your case, please call our office to discuss your case. At that time, Curt or his well-trained staff will advise you whether or not we can assist you with your type of case. You can either e-mail his office or call during work hours. If you pre-pay to get your case started, your case will be put in the que and work will begin on organizaing your documents for examination. We cannot start the "lab work" without payment in advance. This is industry standard so our examiners maintain objective ethical standards. For faster service, sign up for the $400 Verbal Opinion and follow the procedures for submitting your handwriting samples. In most cases, you will be speaking with Curt Baggett within 24-48 hours to discuss your case with you by phone. After you receive a receipt, feel free to request an appointment that fits your schedule. Instructions: Press "Add to Cart " button and fill out the on-line ordering information using any major credit card or Paypal. This option will only occur after your documents have been examined and after the Gold Letter of Opinion Option has been paid for. Order Court time now, prepaid by the day. All Other Expenses are billed at the hourly or the negotiated rate. *$500 will be credited to a new date upon rescheduling or refunded upon cancellation. I did not know what to do until I spoke with you. Thanks for your expert letter and advice. My attorney, Rodney P. Durham of Victoria, Texas said you did well. Thanks for writing the U.S. Department of Education for your expert letter about the forged student loan. You have saved my credit and deleted a $12,426.00 promissory note debt, for which I never signed nor contracted. You are wonderful. Thank you for your professional assistance. TIA CHARLES, THE LAW FIRM OF LAWSON,FIELDS,MCUE,LEE AND CAMBELL. P.C. Thank you for getting me released from jail. Im telling everyone I know about your handwriting expert ability. Thanks for comparing the Bank statement with the other seven (7) documents and for your letter proving the forger. Thanks for your prompt attention and for your quick forgery letter. My check is attached. Thanks again. Your second letter is better than the first. This time you identified the check forger and we have filed criminal charges. My sisters daughter captured my mother, her home and money and assets with a forged Power of Attorney and a forged will. Because of you, I now have my mother, most of the money has been returned and criminal charges are pending. Thanks to your expert letter and expert testimony in two different courts. My aunt is charged with a felony hot check and the prosecutor has indicated to us that she would dismiss the case if we can get her an affidavit of forgery. Thanks for your quick response. Thanks for speaking to me. I am sorry for the "Bulk" of documents (27 pages) which I sent airborne to you. Your notarized opinion should dispute and clear up the forged lease contracts and credit card center. I really appreciate your assistance. My husband died and all of a sudden his family found a change of Beneficiary on his Life Insurance and collected my $100.000.00 policy benefits. My attorney has used your letter to file a lawsuit to try to get my money. Thank you for representing me. As you now know, since you are a handwriting expert, the notary from the Title Company forged my signature, and was involved in a fraudulent transfer of property. Thank you for your Expert letter outlining the different forgeries. I have given the FBI your letter and credentials for their investigation. Im looking forward to meeting with you. My father passed away and the will the state used never looked or sounded right to me. 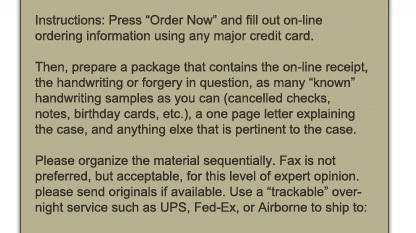 The suspects writing is included so you can decide 1) if its forged, 2) who did it. 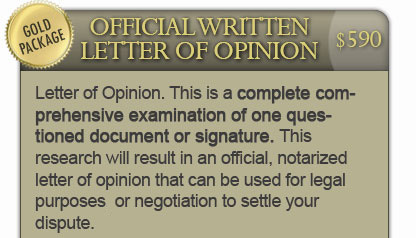 Your notarized opinion letter and credentials are being filed with the probate court. Thanks you for all your help.